Global environmentalism entered the digital age when the 2006 Environmental Performance Index (EPI) was released at a meeting of the World Economic Forum in Davos, Switzerland last week. 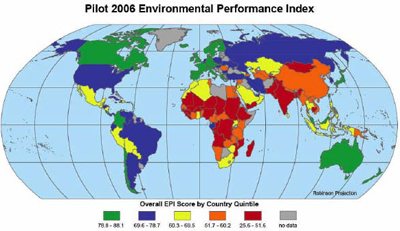 Developed by the Center for Environmental Law & Policy at Yale University and the Center for International Earth Science Information Network at Columbia University in collaboration with the World Economic Forum and the Joint Research Centre of the European Commission, the EPI pilot study is the first to measure and analyze how some 133 nations around the world currently perform against 16 indicators of environmental protection. Overall EPI Scores by country (higher scores reflect better overall performance on a scale of 0-100). Green: 78.8-88.1, Blue: 69.6-78.7, Yellow: 60.3- 69.5, Orange: 51.7-60.2, Red: 25.6-51.6, Gray: no data. “The EPI centers on two broad environmental protection objectives: (1) reducing environmental stresses on human health, and (2) promoting ecosystem vitality and sound natural resource management,” the report says. The US (78.5) ranks well down, and despite its superpower status, barely manages to crack the top-30. The US performs 28th in the world overall, lagging many European nations, Canada and Malaysia. When viewed among the nations of the Americas, our performance on measures for agricultural, forest and fisheries management is dead last. The Top 10 (Overall EPI Score) are: New Zealand (88.0), Sweden (87.6), Finland (87.0), Czech Republic (86.0), United Kingdom (85.6), Austria (85.2), Denmark (84.2), Canada (84.0), Malaysia (83.3), Ireland (83.3). Russia (77.5) ranks 33nd, Brazil (77.0) ranks 34th, China (56.2) ranks 94th, India (47.7) ranks 118th. As a first effort, the index has its shortcomings, both in terms of methodology and utility. The report acknowledges that there is currently a lack of reliable data, gaps in existing data, and limited country coverage. These remain as problems to be addressed in future efforts. As it is, the report says the EPI “falls short in covering the full spectrum” of environmental issues such as waste management, acid rain, heavy metal exposures, wetland loss and ecosystem fragmentation. “The Pilot 2006 EPI represents a ‘work in progress’ meant to stimulate debate on appropriate metrics and methodologies for tracking environmental performance, enable analysis, and highlight the need for increased investment,” the report says. Problems notwithstanding, the release of the EPI represents a great accomplishment and an invaluable tool with far-ranging applicability to addressing modern day environmental issues. Considering the magnitude of these issues, and the threat they present to the quality of life on earth, it serves as a model for a scholarly and systematic approach to bringing about positive change, and as a beacon for international cooperation and collaboration.